Autumn’s here, the nights are drawing in, there’s a definite chill in the air and there’s pumpkin spiced everything, everywhere. Halloween’s just around the corner on 31 October. Dressing up in creepy costumes, going “trick-or-treating” and scaring ourselves stupid watching horror movies – ever wondered why we do it? Here’s some info on why Halloween’s a thing and some ideas on how you can celebrate it this year. 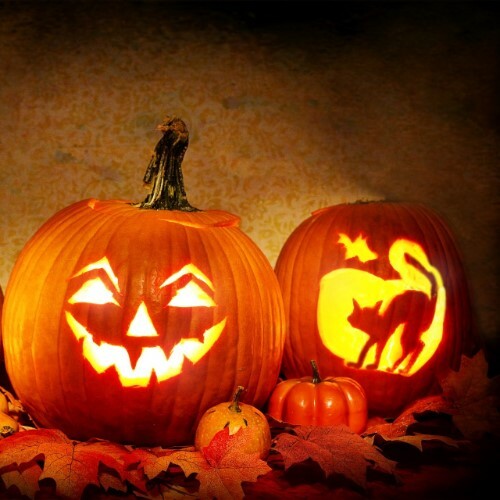 The word Halloween or Hallowe’en comes from All Hallows’ Even, meaning the eve of All Hallows’ Day (All Saints Day). Halloween celebrations are thought to date back to Samhain – an ancient Celtic festival, celebrating the end of summer and harvest and the start of the Celtic New Year on 1 November. Why do we celebrate Halloween? Well, it was believed by many that on the night of 31 October, the boundary between the spirit and living worlds was weaker, letting spirits return to the living world. So, people would dress up in scary costumes and light bonfires to scare off any evil spirits that might’ve been lurking. From carving pumpkins, dressing up in creepy costumes and going out “trick-or-treating” to staying in and scaring yourself to death binge-watching horror movies, there are loads of ways you can celebrate Halloween. Here’s some of our favourite Halloween ideas. Cutting eye-holes in a sheet and flinging it on over your head might’ve been an awesome Halloween costume idea when you were younger but, these days Halloween costumes are less about scaring the neighbours and more about getting Insta likes. The best way to get those likes flooding in is with a super-gory costume or with some beautifully frightening Halloween make-up. And, how are you going to document your work of Halloween-y art? With a perfect selfie (or 10), obvs. The Portrait Mode on the iPhone XS is awesome, it brings depth to your selfies and you can even tweak the depth after you’ve taken the photo. It gives you that pro “Bokeh” effect, blurring the background, bringing clarity and vibrancy to whatever you’ve got in the foreground – i.e. your face in all its gloriously gruesome, Halloween glory. Got all your mates round before your big Halloween night out? Want to get a group selfie but, don’t want to sacrifice the axe sticking out of your mate’s head? It completes their zombie costume, after all… The Google Pixel 3 has the answer: Group Selfie. Just zoom out to get everyone, costumes and all, in the shot. If heading out “trick-or-treating” or on a Halloween night out isn’t your thing, but you still want to show off your awesome costume, why not have a Halloween party? Grab yourself some demonic decorations and start planning those Halloween party games. How about bobbing apples? Or pin the bone on the skeleton? And make your house fit for a monster mash, complete with a spooky playlist. If dealing with the pressure of making the perfect Halloween playlist is just too much, check out some of the spooktacular (sorry, not sorry ) Halloween party playlists on Apple Music or Deezer. Not only does that leave you with one less thing to do but, thanks to Go Binge, you can keep the party going without using any of your data allowance. If you don’t fancy being the host with the most, simply rock up to one of the organised events happening around the country. Every year top theme parks, like Thorpe Park and Alton Towers pull out all the stops and create terrifying live mazes and spooky offerings alongside their usual rides and attractions – and this year, they’ve seriously upped the stakes. Dressing up and heading out to a Halloween party not your thing? Then why not grab some snacks, a blanket and a pillow (for eye-covering purposes) and have yourself a good ol’ Halloween movie fest? Netflix are bringing out the big ghouls this year with more fearsome flicks than you can shake a broomstick at. Go retro with The Shining from 1980, or bring it up to date with 2017’s Veronica which is known as one of the scariest films ever made. But will you make it to the end? (And don’t try the old “I ran out of data” wimp-out, because you can stream ‘til you’re blue in the face without killing your data thanks to Go Binge).